The Petaluma Arts Center & the Art Around Town Committee is pleased to announce a CALL FOR ART for the upcoming Petaluma Valley Hospital Show. Exhibition dates are August 9 – December 13, 2017. You are invited to submit up to 5 images of your artwork. Space is limited; art will be accepted on a first-come, first-accepted basis. Works must be appropriate for a hospital venue. Please, no nudes or violent images. Keep in mind that we are encouraging healing in our community. 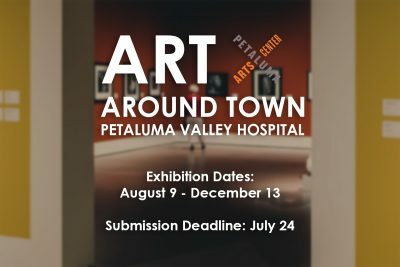 For direct access to the online Prospectus & Entry form please follow the provided link below, or go to petalumaartscenter.org and click on Exhibitions > Call For Entries: Art Around Town.